Hits Barcelona with the Gumball Rally and demands some attention. When the Gumball 3000 Rally enters a city, its massive parade of eccentrically-styled supercars is easily capable of drawing quite a bit of attention. 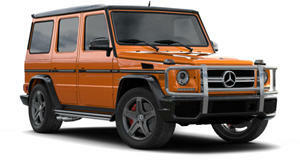 But one participant that really stood out in the rally is the Brabus rendition of the Mercedes-Benz G63 AMG 6x6. Seen here making a very impressive entrance into the event venue in Barcelona by choosing the direct route, this was obviously not planned for any run-of-the-mill autos.